The people who hit the streets, on the first of May in Italy, wanted to celebrate the day of labor in the major cities. Also, to express their worries about the lack of work and the unemployment (which is now 43 percent among young people). Their credo: more work for everybody, less work per person. 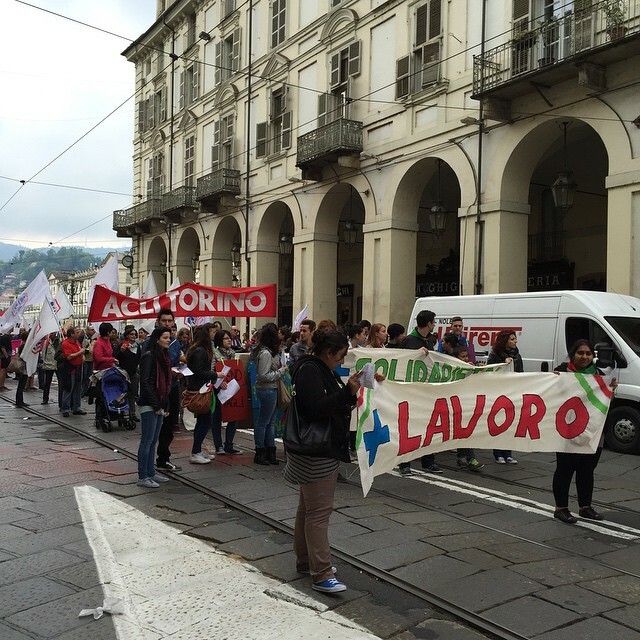 Early in the morning, the traditional May Day demonstration hour for the Turin working class, dark rumor was spreading: Milan is going to go wild, riots just like Baltimore. A mother confessed: My daughter crept out early this morning to protest against the EXPO in Milan, and I am so worried. Not that I approve of the Expo, but those protests nowadays run out of control. Yet somebody has to protest. I used to do it myself. It’s her turn now. Renzi, the youngest premiere in the world, invited the whole world to Milan’s EXPO. Renzi said that Italy had decided to embrace the world. Italy is showing some signs of the willpower to be reborn on a different basis. The 2008 crisis is not an aberrant nightmare anymore, but the starting point for new ideas and new people. The EXPO however, was off to a balky start, with unfinished works, much corruption, and hasty last-minute efforts. Whistleblowers presented us with an EXPOLEAKS site, very convincing. This is Italy after all, and very few things can possibly be transparent and clean, even with good intentions and good-faith efforts. Corruption and economic mafias are the way of life, the habits hardest to change. When the Black Bloc broke into the peaceful No Expo demo, hell broke loose. They were mostly Italian anarchists, along with hooligans from France and Spain who slipped past the border police with the ease of riotous football fans. Beppe Grillo, the leader of the M5S movement, seized the opportunity to opine that the cops should be fired. However, the trouble could certainly have been worse. In downtown Milan, some shops were smashed, banks were trashed and cars were burned. Nobody died, though there were injuries and arrests. This was classic domestic Italian political violence. Nobody but Italians is at all upset about Milan staging a big world exposition. The clandestinis and the Moslem terror are not the Expo issue. Of course one likes to think that an expensive celebration would unify Italy, but the Expo is a scattered operatic spectacle instead, with Andrea Botticelli, the blind singer, entertaining huge crowds in the Piazza del Duomo, while a few streets away at the La Scala opera house the cops and the Black Bloc rampaged in deafening noise. With that said, the next day the Milanese spontaneously cleaned up their city’s riot mess, and life went on, more or less. They even had a big demo in support of their mayor and the city. In the Turin May Day demonstrations, all the demonstrators seemed to have found or invented ingenious badges, T-shirts, slogans, or insignia, probably to distinguish themselves from the crowds of pious, shabby rural Catholics who have shown up to adore the Shroud of Turin. 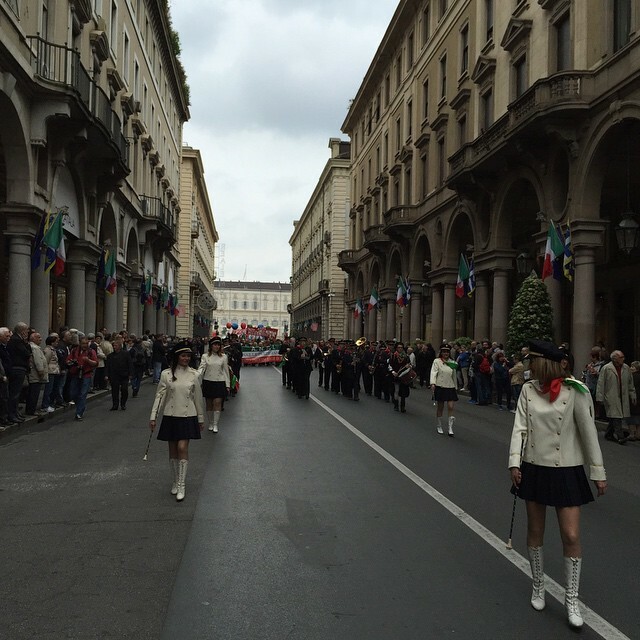 The May Day parade in Turin was quite a show, with beautiful royal squares and boulevards covered with dignified walking bands, with elegant flag bearers and majorettes in Prada-like gear, politicized puppies, even acrobats. The wary police also sported exotic insignia, with specialized antiterrorist troops, the Alpini mountain battalions, even civilian volunteers in emergency orange gear. Turin finds it rather difficult to riot when the city plays host to the pious faithful: the miracle-seekers, desperate souls, youthful catechism classes fresh off the church bus, people on crutches, the sick and the stricken, the people in wheelchairs… Even the Pope is scheduled to show up. He’s rather popular. No one wants to upset Francis. Of course a certain “No Expo” sentiment is also present in Torino — it embarrasses the Left that the medieval Shroud of Turin is presented to the gullible masses, a commercialized fake, a literal relic. But Faith is as blind as Love, and scolding a Shroud true-believer is like telling him his girlfriend is ugly: it just won’t help anything, so why be rude. This is Italy, after all. This entry was posted in Uncategorized and tagged demos, EXPO, Italy, milan, Pope Francis, Shroud, Turin. Bookmark the permalink.